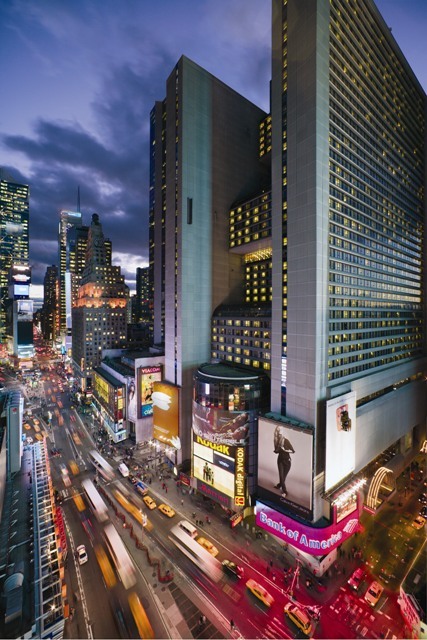 New York City has a plethora of hotels to cater to any type of traveler. I had the pleasure of recently staying at one of New York’s icons, the Marriott Marquis Times Square. 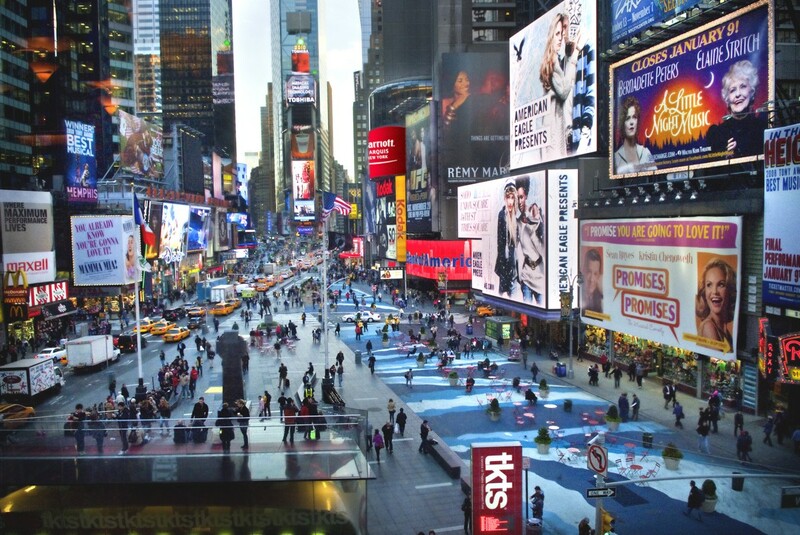 The hotel is situated right in the heart of Times Square located at 1535 Broadway. If you’re coming to New York for a Broadway getaway or a boys weekend, you can’t ask for a better location. Amazing theater is surrounding you and you’re steps from Hell’s Kitchen, a popular gay neighborhood. Want to go somewhere else? Virtually every train in the New York subway is a block away. The lobby is located on the eighth floor, and even though the hotel is massive, the lobby was quiet and pleasant. I received welcoming service from the front desk agent who graciously upgraded my room so that I had a view of Times Square. After grabbing a Starbucks (there’s one in the lobby and on the ground floor), I headed up to my room, on the 36th floor. The glass elevators provided a speedy ascent and a great view of the property. The rooms at the Marriott Marquis are very cozy. The décor isn’t outdated and for a New York hotel room, they’re very spacious. My room had a king bed and a sofa bed with a spectacular gaze South into Times Square. It was exactly what I needed to break away from the hustle and bustle of the city to re-charge and then jump back into it all. I had factored in a couple Broadway shows with my stay, so it was perfect. The Marriott Marquis also has some incredible dining venues. The Atrium Lounge on the 8th floor makes a mean dirty martini and you’re able to enjoy it with the soaring atrium rising above you. You can ascend to the top of the atrium and hotel for The View, New York’s only revolving restaurant. It’s quite an experience to see the entire city from the top of Times Square. Add those to the Katen Sushi Bar and the Broadway Lounge – there’s something for everybody, and they’re all in fabulous settings. Gym bunnies and workaholics need not fear. The gym at the Marriott Marquis is state of the art and as you’re running on your treadmill you are overlooking – you guessed it – Times Square. People and advertising watching from above make for an enjoyable run. If you’re here for business, there is Internet access throughout (for a fee) and a business center. If you’re having a meeting in New York, there is also incredible meeting space. Didn’t have a chance to see all of the banquet rooms on this recent visit, but with the expected increase in weddings, given the recently passed marriage equality legislation, New York Marriott Marquis will be a place to check out for upcoming nuptials! I love New York, it’s my second home and one of the most incredible cities in the world. Next time you’re here, think about staying at the Marriott Marquis – throw yourself in the middle of it. I guarantee you’ll fall in love with New York even more.